Halloumi is one of those cheeses that holds shape when it heats, going gorgeously soft inside and crisping up a little on the outside rather than going gooey-melty. Fried Halloumi with Tomato Sauce is a nice, simple dish that works best in the Summer, when all of the fresh ingredients are at their peak flavour. Halloumi is a soft, brined cheese that can be found in many Canadian grocery stores – it’s a salty cheese that holds its shape well when heated. I like to eat it fried, on its own as a snack, or raw, but the sweetness of the tomatoes helps vary the flavours on your tongue, and cuts the saltiness of the cheese somewhat. A rich, savoury meal that's a great entree for vegetarians! Fry cherry tomatoes in 1 tbsp olive oil; salt lightly. After 5-8 minutes, add minced garlic; fry 5 minutes. Add torn basil, stir over heat. Pour tomato sauce into a bowl, and drizzle with red wine vinegar. 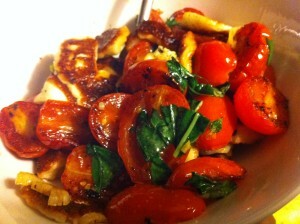 In a clean pan, fry halloumi in olive oil until golden brown on each side. Add to tomato sauce and stir to combine. Halloumi is a salty cheese, so have a light hand with the salt. I find this dish a bit decadent – I’m not sure why – but I always feel like I’m treating myself when I make it. I usually have a few basil plants in my container garden, and so there’s always lots of fresh basil on-hand. Traditionally, fried halloumi is served with watermelon and mint, and though that’s certainly something I’m going to try, this is one of my standard dishes. This salty cheese keeps well, and so it’s an easy thing to keep in your fridge until you’re in the mood.